Ernst Jaggi brought many musical skills with him from his native Switzerland to Green County, a center for Swiss culture in Wisconsin. 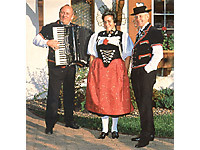 A singer and yodeler, Ernst has performed as a soloist for years with the Jodlerklub New Glarus and at the Chalet Landhaus in New Glarus. Ernst also plays a rhythm instrument called the talerschwingen, made by a large coin spinning in a bowl. For his performance, Ernst would concentrate on yodeling demonstrations.